I arrived at the realignment meeting just in time for Chief Lanier to explain why all this was happening. 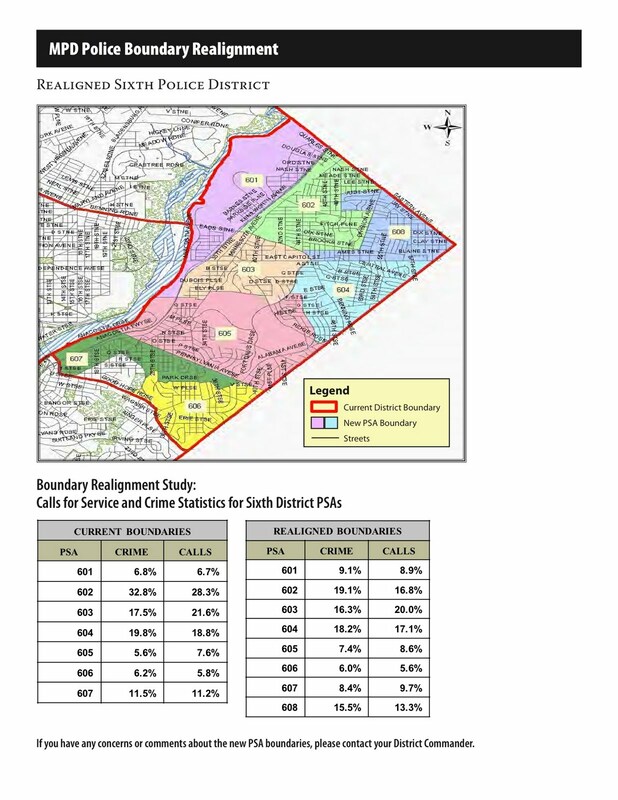 To be clear, POLICE DISTRICT REALIGNMENT HAS NOTHING TO DO WITH WARD REDISTRICTING. Chief Lanier explained that realignment decisions were based on number of crimes, volume of calls for service, manpower/womanpower, and natural boundaries to name a few. PSA 602: Is considered a mega-PSA and it has 35% of the crime in 6D. It will be split into two PSAs, 602 and 608. The split will put Lincoln Heights and Clay Terrace in two different PSAs. Since PSA 602 already has 2 Lieutenants, no new Lieutenant is needed. Chief Lanier stated the final decision is about five months away. Here are the handouts with more detailed information. If you have issues with the PSA boundaries or support the boundaries, make your voice heard. Contact Commander Robert Contee at robert.contee@dc.gov. Other notables in attendance: Assistant Chief Groomes, Assistant Chief Durham, Seventh District Commander Maupin, Councilmember Mendelson, Councilmember Alexander. There were some other MPD in white shirts, but I don't know their names. I'm assuming they were top brass.